Appendicitis treatment depends on the appendicitis pain and appendicitis symptoms. The only proposed treatment of appendicitis is surgery (appendectomy). The main objective of appendix surgery is to remove it before its rupturing due to which infection spreads throughout the abdomen (peritonitis). Whether patient is suffering from signs of appendicitis or not depends on careful examination and appendicitis test by a doctor. There are two ways through which appendix surgery can be done i.e. traditional and laparoscopic. Laparoscopic surgery needs three or four cuts and traditional appendectomy need only one large incision. Patients feel better after surgery. In case of appendix rupture, infection spreads in the whole body and patient have to stay in hospital for a long time. In such situation, treatment will follow intravenous antibiotics and fluids. 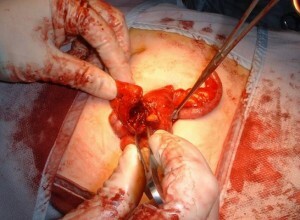 A burst appendix causes the surgery to be more complicated. Radiologist places a drain in belly to remove some infection of burst appendix before appendicitis operation.